Buying baby clothes can be tricky business, especially for first time mums, there are so many baby dresses and outfits to choose from! I know I had a difficult time and made some blunders with my purchases along the way. Take advice from the guide below there are plenty of tips from mums on ‘how to buy baby clothing’ successfully. What kind of baby clothing will I need? Buying baby clothing can be a boggling experience, as your bump grows you will probably start to panic – ‘I don’t have any baby clothes!’ You will probably do what I did and start wandering around all the stores that sell baby clothes, baby furniture, baby gifts and so on. The choice is endless, this is where the danger lies in buying too many clothes for baby. Too many baby clothes means your baby will only wear them once or twice (or sometimes not at all), babies grow very quickly and the next size up in that special outfit is needed before you know it! Leaving you with the cutest outfits ever, but no VALUE FOR MONEY. The ideal way to buy baby clothing is to make sure you have enough outfits to get you through the week in a couple of different sizes, but not so many that you have overflowing drawers of baby outfits that haven’t even been unwrapped before your baby gets too big to wear them; or duplicate clothing that you didn’t really need. Well, to be fair, duplicate baby clothing isn’t that big of any issue really, especially in the early days when baby clothes can only be worn once and usually for a couple of hours and all clothing needs to be continually washed and washed! 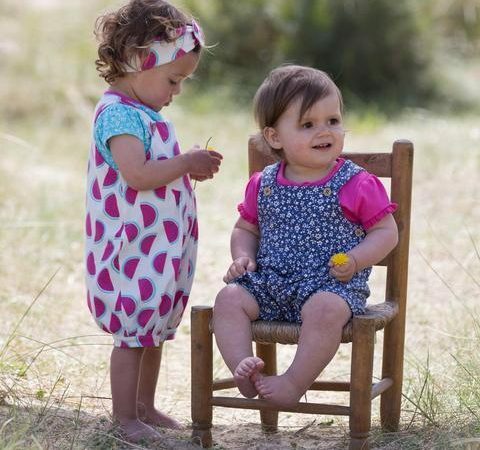 In the early days make sure you have numerous baby dresses, sleepsuits, comfortable baby grows suits, and sleeping suits, basic tees, comfortable cotton pants, warm cardigans and coats or sunhats, depending on the season. Before you buy new baby clothes check what time of the year your baby will be born, it could be around sale time, which is the best time to buy bulk lots of newborn baby clothing that you are going to need. Once all of the confusion has settled you will have an exciting time buying your first newborn baby clothes, it is much more fun than buying clothes for yourself (honestly) – and then in time you will be having more fun when your baby grows out of that first lot of clothes, you will find yourself a more experienced shopper in the baby clothing department. Hopefully this comprehensive guide to baby your babies first clothes has been helpful to you! Remember, don’t rush in a buy too many clothes before your baby is born, you can always buy more of the garments you need after the arrival of your newborn.